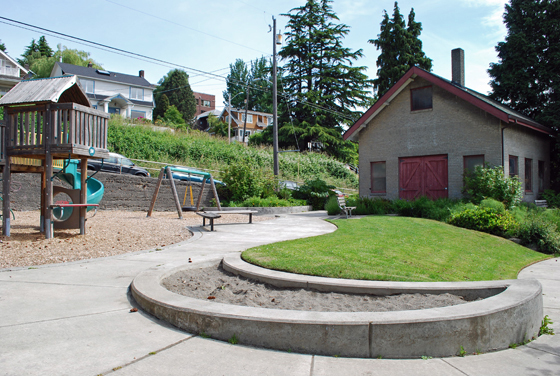 Ward Springs Park in Lower Queen Anne is easily one of the coolest playgrounds in Seattle. Let me qualify this though: What I think is cool is much different from what a six-year-old thinks is cool. And since I don’t have any kids, I’m looking at this from a complete non-parent, adult perspective. 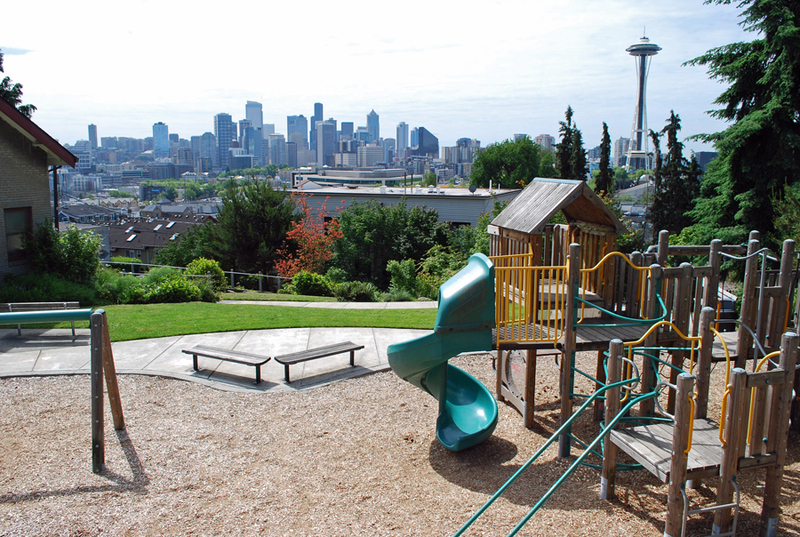 But with a fun play area and a spectacular view of Seattle, Ward Springs Park is guaranteed to be fun for all ages. I randomly came across Ward Springs Park (it’s tucked away on the corner of 4th Ave. N. and Ward St.) when I was strolling around Queen Anne the other day. The first thing I noticed was the awesome view of the Space Needle and downtown Seattle. I obviously encourage you to keep a close eye on your kids, but Ward Springs Park definitely gives you something else to enjoy while your children pound around on the playground. Ward Springs Park isn’t huge, but there’s still plenty to keep your kids occupied. There’s a big play set with slides, ladders and poles, and there’s also a tire swing and a sandbox. For the kids who don’t want to be too rambunctious, there’s also a short, winding path, some nice flowers and a small stream inside the park. One of the unique features of Ward Springs Park is the historic brick pump house. Believe it or not, that pump house once provided every drop of water to Queen Anne, pumping out more than 80,000 gallons a day. The pump house is inactive now, but part of the pump is still on display and it offers a great educational opportunity for your kids. 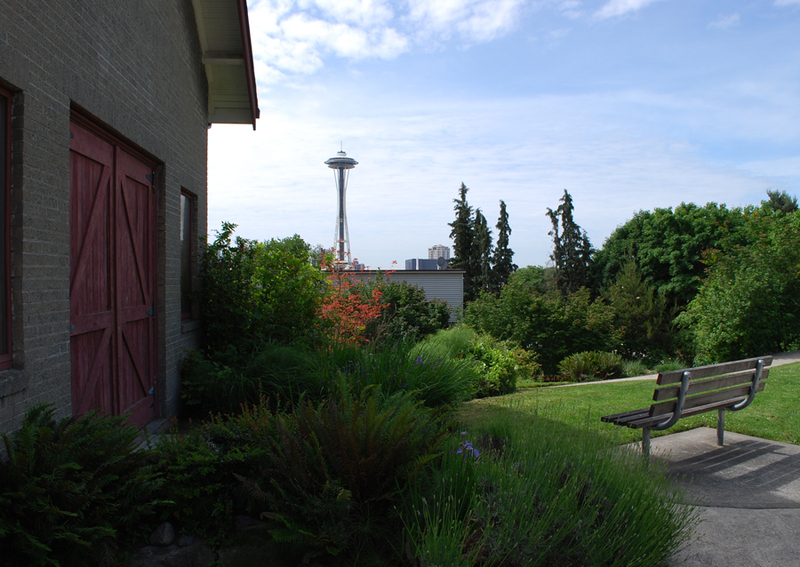 Aside from Kerry Park and a few other “secret” viewpoints, there aren’t many public spots in Queen Anne that offer such an awesome view of Seattle. When you add fun activities for your kids to the equation, it’s hard to argue Ward Springs Park is not the coolest playground in Seattle. I don’t think you have to be a rocket scientist (or even six-years-old) to do that math. Have you ever been to Ward Springs Park? 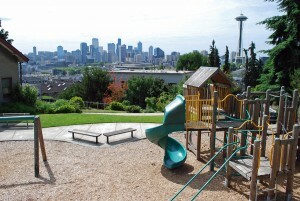 Do you think it’s the coolest playground in Seattle? Is there a cooler playground you like to go to? We’d love to hear from you! Please leave your comments below or connect with us on Twitter, Facebook and Google+. Don’t forget to also check out Seattle Bloggers for more fun places to check out in the Emerald City!